State sensors tell your 'bot something about its condition and local environment -- tilt, temperature, and the like. These can be used to change your 'bot's behavior in ways (ideally) that help it protect itself and get around. 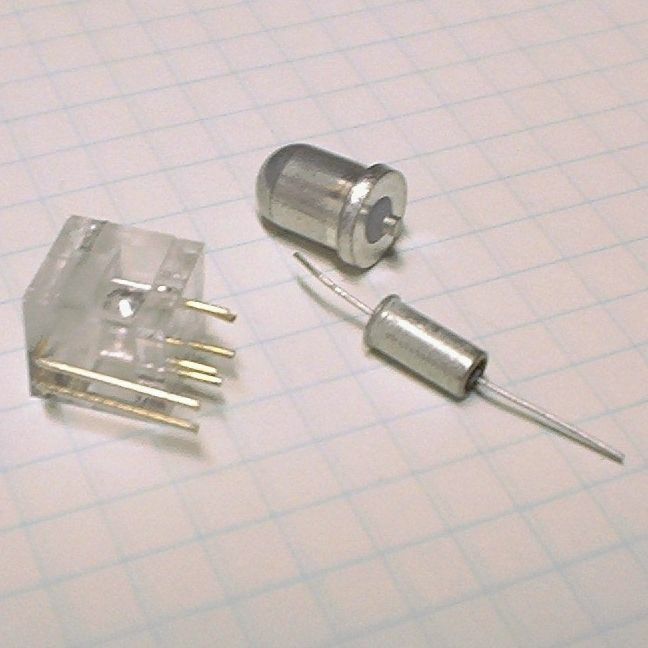 Thermistors are the most common temperature sensors you'll run across -- they're just temperature-sensitive resistors (resistance goes down as temperature goes up). The internal chemistry of thermistors is quite tailorable -- this allows manufacturers to make thermistors with a wide selection of temperature sensing ranges. Note that thermistors tend to exhibit a fair amount of variability from unit to unit. So if you're using a pair of thermistors to give your 'bot the ability to find warm or cool areas, you'll want to incorporate a potentiometer to allow you to "tune" their response a bit (or else, buy a number of thermistors and attempt to find a "matching" pair). AD-590s are temperature sensing integrated circuits which output a current proportional to temperature. While more expensive than thermistors (about $5 US each, vs. a few cents for a thermistor), they are also much more accurate. This allows you to dispense with matching and tuning should you be using temperature sensors as a "homing" device.